A Pizza Date is something that is enjoyable for all parties whether you are sharing a Pizza of choice or slices of Pizza with your favorite toppings. I recently enjoyed a pizza date with my hubby & baby boy. 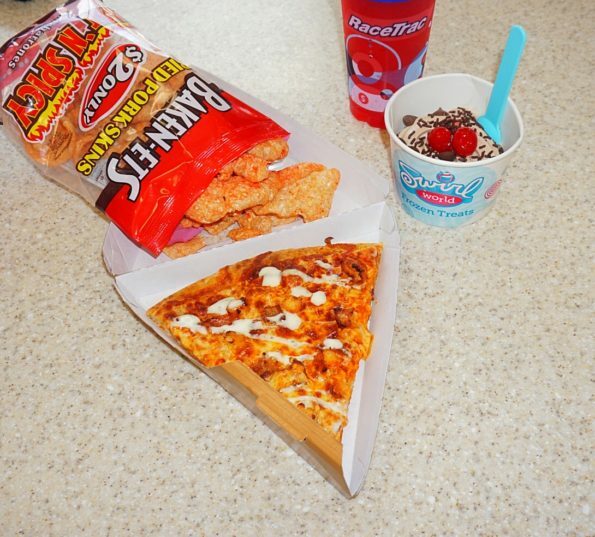 We all love Pizza but everyone loves their specific toppings. Baby boy is a cheese guy, my husband loves supreme pizza and me on the other hand I love a yummy slice of pizza with a kick. The Buffalo Chicken Pizza was a great option for me. At RaceTrac the Pizza Dough, mozzarella cheese, sauce and toppings all come together to make the Pizza. The Pizza is a 16″ pizza that is cut into 6 slices. 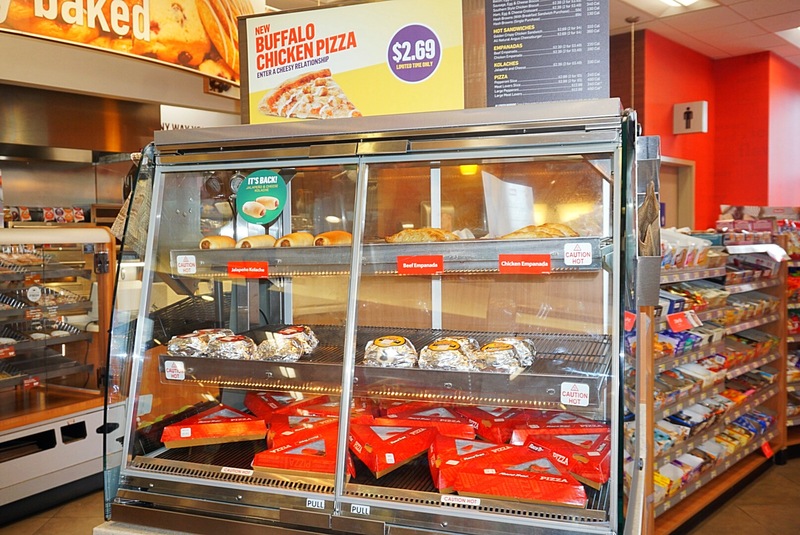 The slices are packaged and placed in a hot case ready to serve. Hot, Fresh and Ready to go. 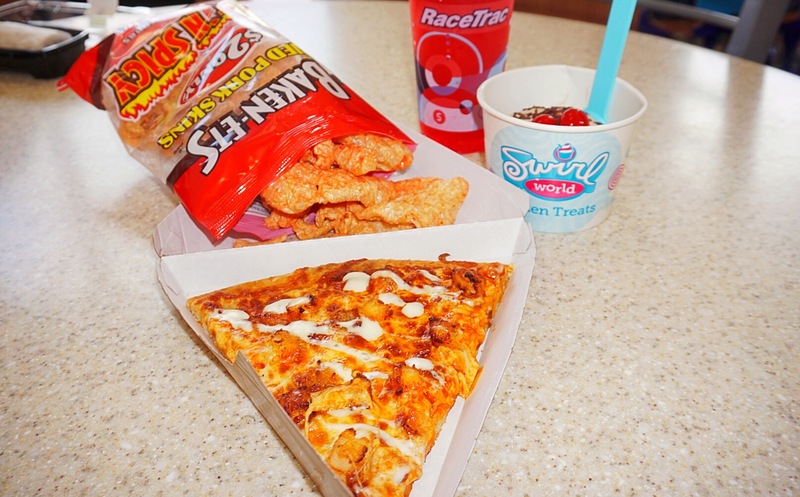 The Buffalo Chicken Pizza is available for a limited time at RaceTrac. Made with traditional Frank’s Hot Sauce as the base, 100% whole milk cheese, crispy breaded chicken. Topped with ranch dressing. This Pizza was really good. 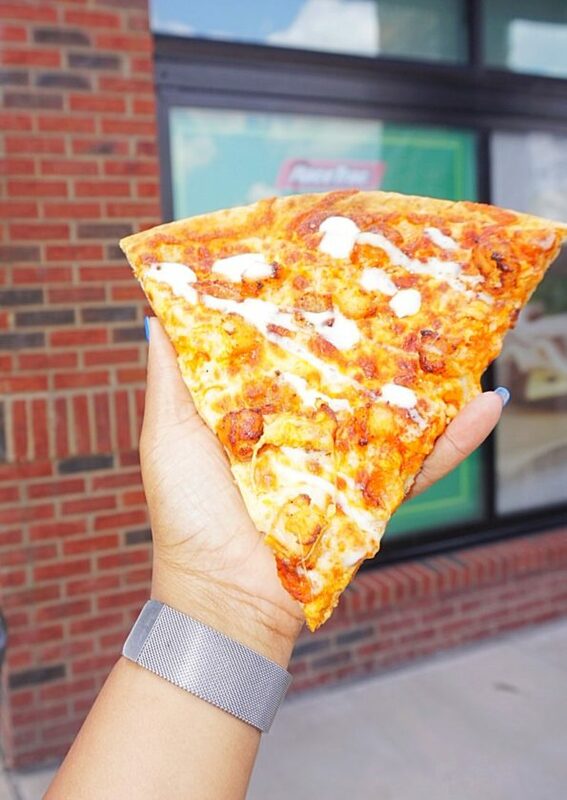 A spicy pizza with the ranch to cool the heat down. So good. Everyone loves a little something with their pizza. My favorite things to eat with my pizza is Pork Skins, and a nice frozen, fruity drink to wash it all down with. 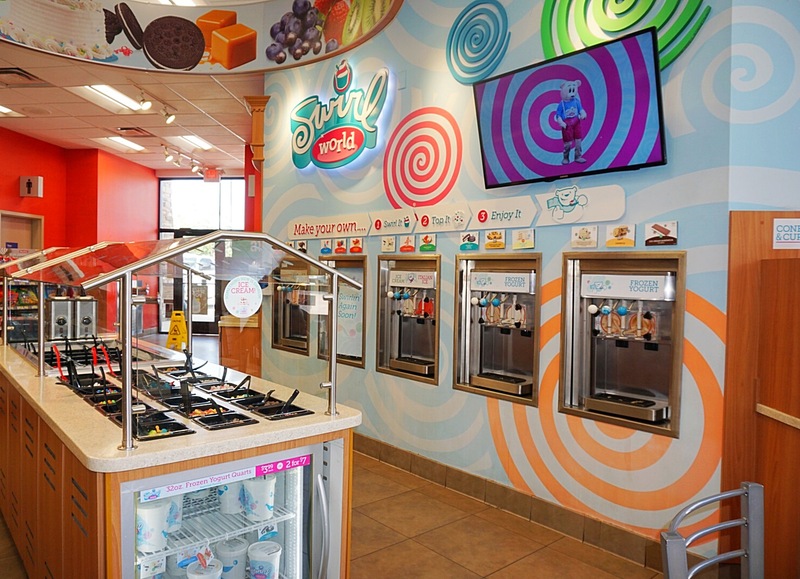 Don’t forget dessert, Frozen Yogurt from the Swirl World Dessert Bar. 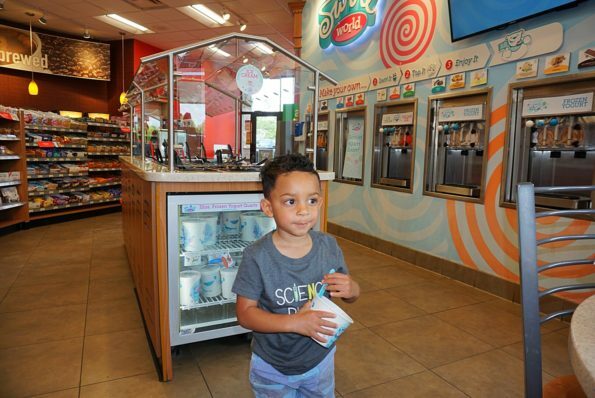 RaceTrac is the only convenience store to offer Swirl World. 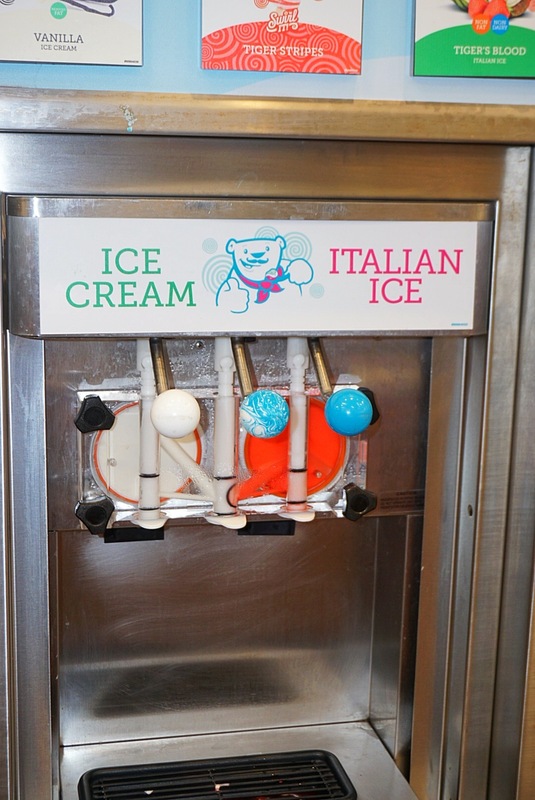 A Dessert Bar with a variety of frozen desserts featuring ice cream, yogurt, sorbets and Italian Ice. Customize your dessert with tons and tons of toppings to chose from. 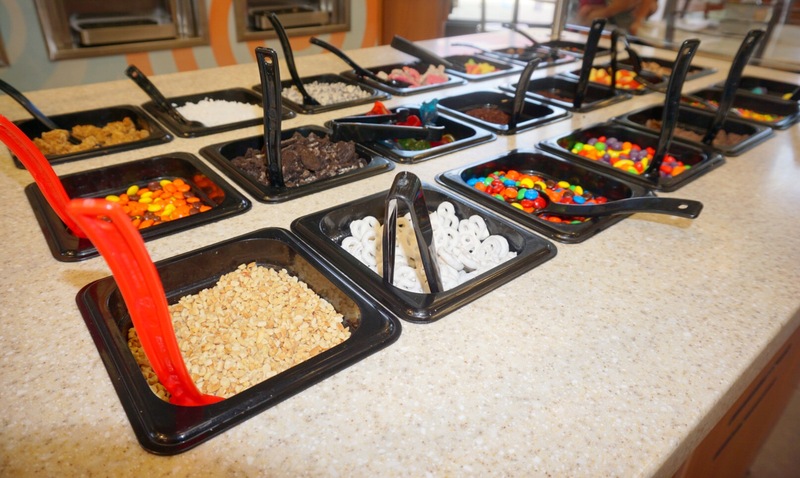 Toppings from fruit, hot fudge, Oreos, gummies, sprinkles and so much more. Perfect afternoon treat for the kiddos. Serve it in a Cup, Cake cone or Waffle cones. The options are endless. 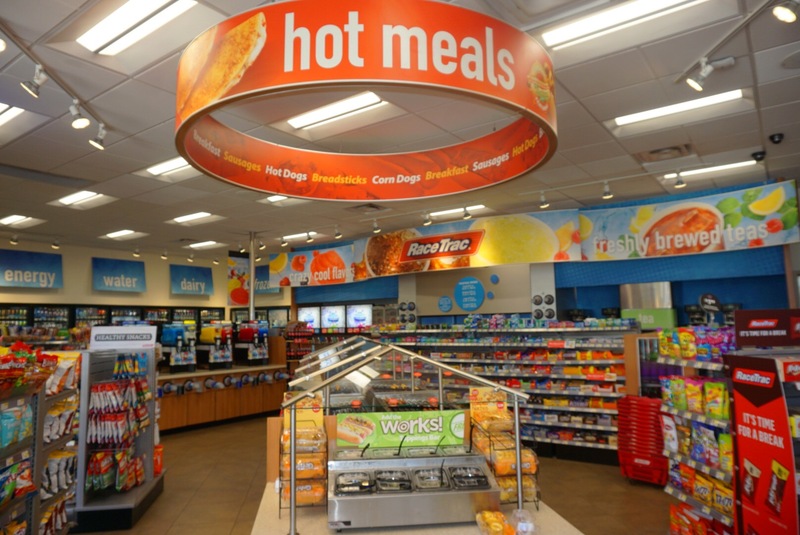 In addition to Pizza, check out the Hot Food section with items like Hot Dogs, Burgers, Nachos and Taquitos. In the mood for something a little on the light side. 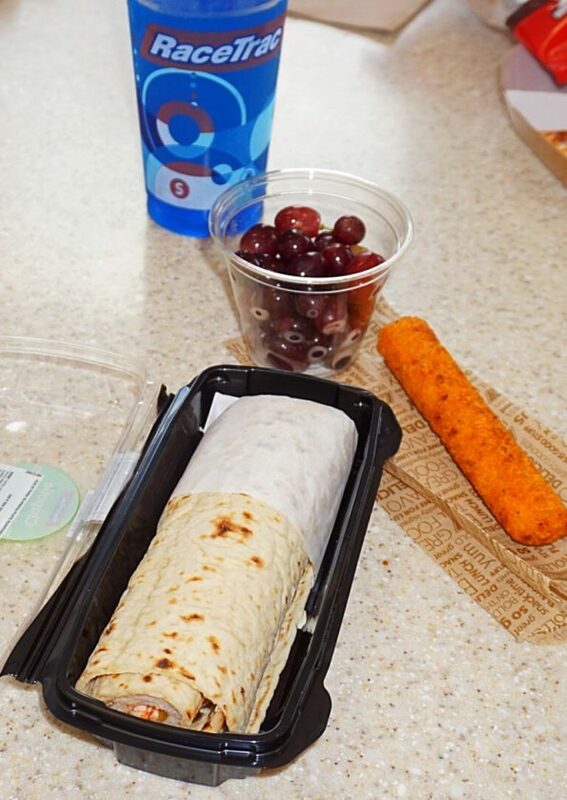 My husband tried the Spicy Chipotle Kickin Chicken Wrap, Fruit and Buffalo Chicken Roll. RaceTrac also serves fresh salads. Recently launching new salads like the Farmhouse Cobb Salad, BLT Caesar Salad, Side Garden Salad and Greek Salad. 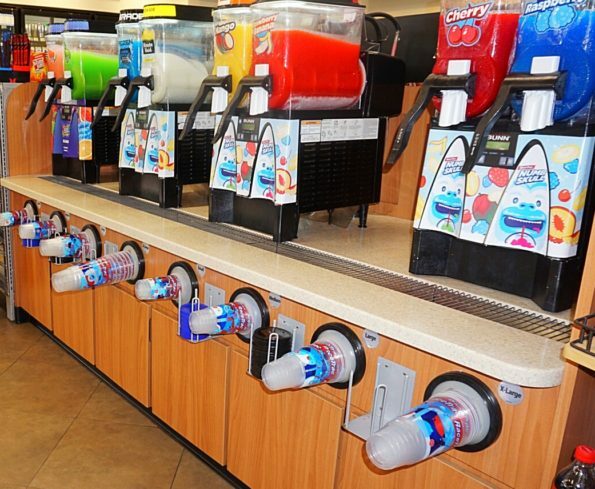 One thing I loved was that there was an abundance of Frozen Drink options to choose from. 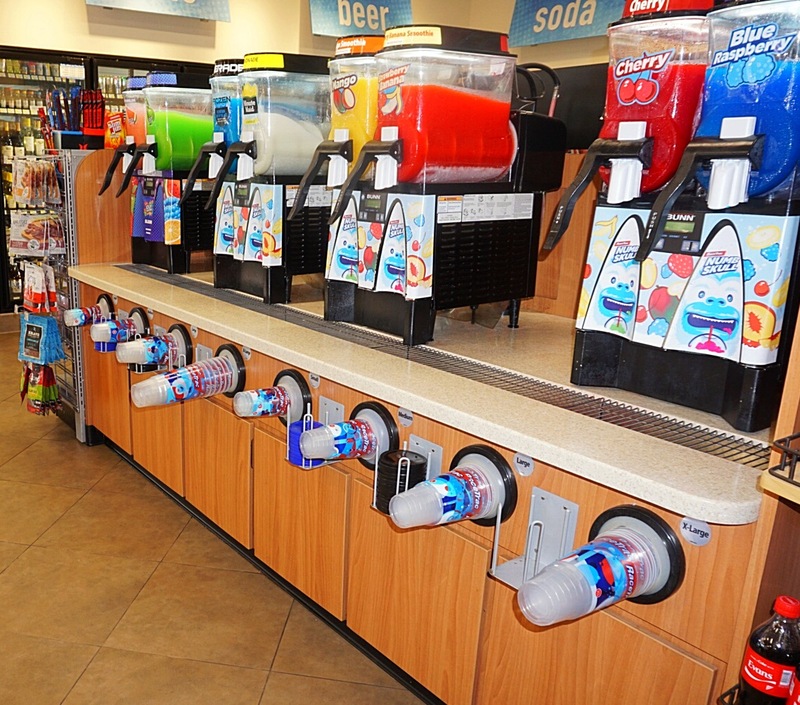 Wash down your favorite Pizza Slice, Sandwich or Hot Meal from RaceTrac with one of these options. 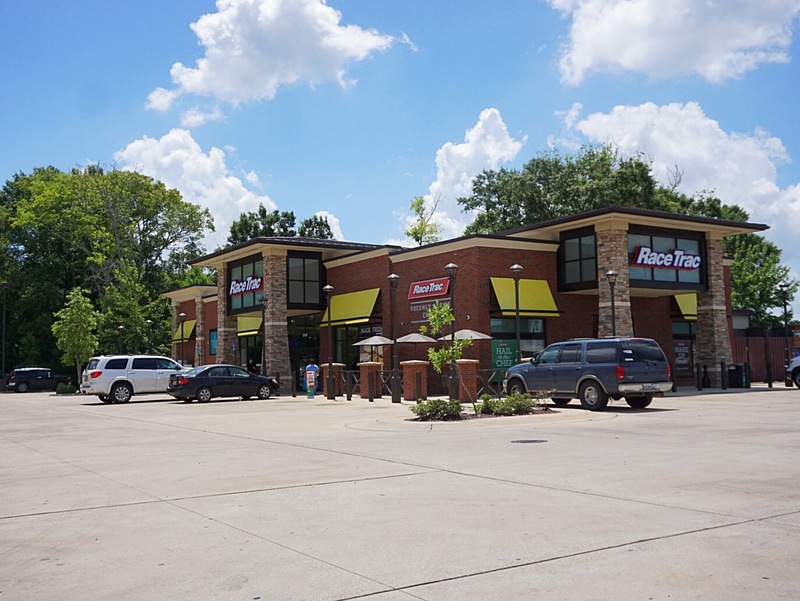 Our favorite RaceTrac is located at 5100 Ambassador Caffrey Pkwy, Lafayette, LA 70508. 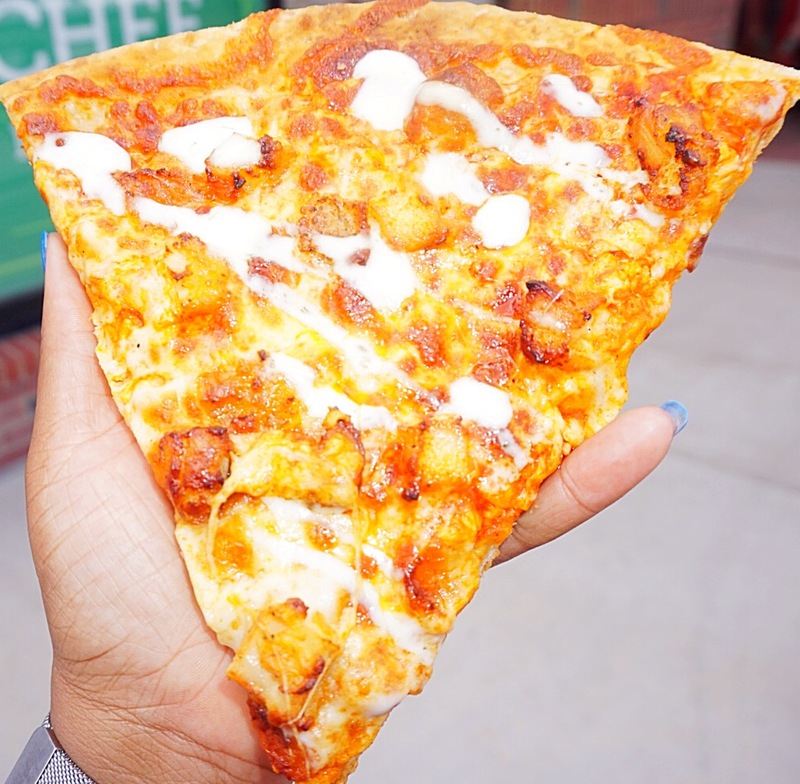 So grab your Family, Kiddos, Hubby or Friends and enjoy a slice of the new Buffalo Chicken Pizza. Get it while supplies last! RaceTrac partnered with influencers such as me for its Pizza campaign. As part of this Program, I received compensation for my time. RaceTrac believes that consumers and influencers are free to form their own opinions and share them in their own words. RaceTrac policies align with WOMMA Ethics Code, Federal Trade Commission (FTC) guidelines and social media engagement recommendations.